Part of owning a home or business in South Florida involves getting repairs done to driveways or walkways. The high temperatures and frequent variations in humidity as well as heavy rains and flooding causes potholes and other types of damage to walkways, driveways and parking lots that must be patched and otherwise repaired. The maintenance process includes asphalt repairs. The types of repairs range from striping, saw cut, and tack patches. At times, you may need to get a new sidewalk. The process involves blocking off non-striping areas. Workers will then use DOT traffic paint to repaint the surface using yellow, white, or blue color. The type of paint our company uses depends on the application and requirements of the work. 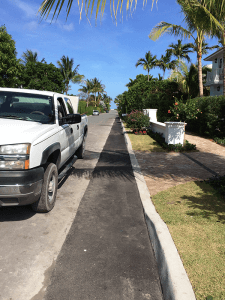 Trinity Asphalt and Paving will offer layout services for new South Florida parking lots or driveways for completely deteriorated lines. What is saw cut patching? Our highly trained and experienced asphalt workers cut around the area of the pothole to form a square edge that is smooth. The flat area that has a vertical shape enables the heated asphalt mix to bind the hole easily. It will make the patch sturdy and reliable. Afterward, the crew will remove all debris and any broken pavement in the area. Our team will change the base material and get it ready for the hot mix asphalt. Our team gets the work done by using a plate compactor. They will then pour the hot mix into the hole and compact the area. If they are working on driveways and parking lots, they will place two layers into the hole until the pothole is filled up. To make the area stable, our workers will add a liquid bonding called a tack coat between the layers of the asphalt. Completing the process involves sealing the seam with hot rubber where the old and new asphalt meet. It is to prevent debris or water from reentering the repaired area. scratch coat (a mixture of repair material and water) gets applied to the area that needs the patching. Our crew will use pressure to make sure that it gets done well. An additional amount of mixture then is added to the thin scratch coat. Workmen will use either a brush or a rag to make the applications. Trinity Asphalt Paving, Inc. performs repairs to asphalt and fixes potholes. We do patches and striping. Additionally, we do new sidewalk installation as well as repairs.